VIPAccessEXCLUSIVE: The Vamps Send Out A Message To Their Fans With Alexisjoyvipaccess At The 2014 Nickelodeon HALO Awards! “The Vamps”: Noun. Boy band sensation that causes pandemonium everywhere and anywhere they go. Members: Bradley Simpson, Connor Ball, James McVey and Tristan Evans together make up one of the biggest boy bands – “The Vamps”. With their incredibly catchy songs that manage to make everyone ecstatic and enthusiastic such as “Somebody To You”, “Wild Heart” and “Can We Dance” to name a few, there is no question as to why The Vamps is an absolute phenomenon. From NYC, to LA, to other various cities all across the globe – it doesn’t matter what language you speak, The Vamps’s music truly unites all Vampettes together. The Vamps’s music manages to make fans feel a sense of being overjoyed, their songs could make them want to dance and also cry of happiness. From having their own album to selling out various shows on their headlining tour – The Vamps have clearly established themselves as a household name. You instantly know when you are at a The Vamps concert when you hear thousands and thousands of screaming fans calling the members’ names and singing their terrific songs. These heartthrobs continue to surpass fans’ expectations with all their phenomenal performances, music videos and other projects and there is no doubt that the rest of 2014 and beyond will be the year of The Vamps. 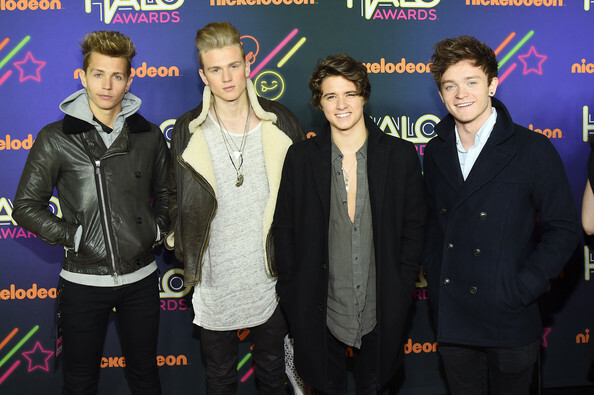 I, Alexisjoyvipaccess had the utmost honor of covering the 2014 Nickelodeon HALO Awards at New York City’s Pier 36 and had the great honor and pleasure of chatting with the charming members of The Vamps. The Vamps send out an exclusive message to all their fans only with Alexisjoyvipaccess.com! Check out The Vamps send out a message to all of you from the orange carpet of the 2014 Nickelodeon HALO Awards below. Thanks for the wonderful message and terrific chat, The Vamps! Check out The Vamps’s amazing message to all their fans with Alexisjoyvipaccess at the 2014 Nickelodeon HALO Awards below! Don’t forget to tune in and watch the 2014 Nickelodeon HALO Awards on November 30, 2014 at 7:00 PM ET/PT on Nickelodeon, TeenNick, NickToons, Nick.com or the Nick App! Previous VIPAccessEXCLUSIVE: Nick Cannon Sends Out A Message To His Fans With Alexisjoyvipaccess At The 2014 Nickelodeon HALO Awards!